Leonardo wrote about his opinions of the superiority of painting over poetry.. Read the following quote from his writings. Answer the questions at the bottom of this page based on Leonardo's opinions. If you contemn painting, which is the only imitator of all visible works of nature, you will certainly despise a subtle invention which brings philosophy and subtle speculation to the consideration of the nature of all forms --seas and plains, trees, animals, plants, and flowers--which are surrounded by shade and light. And this is true knowledge and the legitimate issue of nature, for painting is born of nature--or, to speak even more correctly, we will say it is the grandchild of nature, for all visible things are produced by nature, and these her children have given birth to painting. Hence we may justly call it the grandchild of nature and related to God. The eye, which is called the window of the soul, is the principal means by which the central sense can most completely and abundantly appreciate the infinite works of nature; and the ear is the second, which acquire dignity by hearing of the things the eye has seen. If you, historians or poets or mathematicians, had not seen things with your eyes you could not report of them in writing. And if you, O poet, tell a story with your pen, the painter with his brush can tell it more easily, with simpler completeness and less tedious to be understood. And if you call painting dumb poetry, the painter may call poetry blind painting. Now which is the worse defect? to be blind or dumb? Though the poet is as free as the painter in the invention of his fictions, they are not so satisfactory to men as paintings; for, though poetry is able to describe forms, actions, and places in words, the painter deals with the actual similitude of the forms, in order to represent them. Now tell me which is the nearer to the actual man: the name of man or the image of man? The name of man differs in different countries, but his form is never changed but by death. And if the poet gratifies the sense by means of the ear, the painter does so by the eye--the worthier sense; but I will say no more of this but that, if a good painter represents the fury of a battle, and if a poet describes one, and they are both together put before the public, you will see where most of the spectators will stop, to which they will pay most attention, on which they will bestow most praise, and which will satisfy them best. Undoubtedly painting, being a long way the more intelligible and beautiful, will please most. Write up the name of God [Christ] in some spot and set up His image opposite and you will see which will be more reverenced. Painting comprehends in itself all the forms of nature, while you have nothing but words, which are not universal, as form is, and if you have the effects of the representation, we have the representation of the effects. Take a poet who describes the beauty of a lady to her lover and a painter who represents her and you will see to which nature guides the enamoured critic. Certainly the proof should be allowed to rest on the verdict of experience. Ross, James Bruce. The Portable Renaissance Reader: The Golden Age of Italy and Northern Europe, 1400-1600, Shown Forth in All Its Rich Diversity in the Writings of Its Acknowledged Masters. New York: Viking, 1968. Print. Leonardo da Vinci, often termed the "Renaissance Man," exemplified the Renaissance artists' self-awareness and concern with their craft. These artists not only painted gloriously, but thought about the act of painting itself and what it meant to be a painter. An analogy would be for you to not only go to school, attend classes, do homework, and take tests, BUT ALSO TO THINK ABOUT BEING A STUDENT AND WRITE THE FOLLOWING THINGS ABOUT IT: What makes a good student? How could you be a better student? 1. 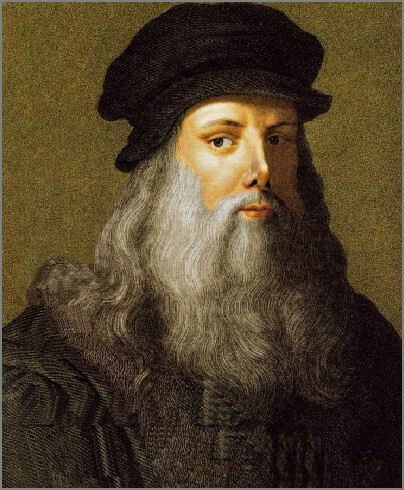 Leonardo stated, "The mind of the painter must resemble _____________________________________." 3. Leonardo called the eye the " _____________________________________________________________________"
5. What does Leonardo believe to be superior: painting or poetry and WHY? Explain his reasoning in your own words. 6. You have heard the saying, "A picture is worth a thousand words." Would Leonardo agree with this statement. Explain why you feel this way.